Should I Sign an AOB? Asphalt roofing – also called composite shingles – is the most popular roofing option in America due to its low up-front installation costs and relatively simple installation. It’s estimated that about 80% of residential homes use asphalt shingles. Made from paper with an asphalt coating to become waterproof. They’re more prone to moisture and saturation, which can cause issues in humid climates. Treated with waterproof resin coating, offering better fire protection than organic. This material is also lighter and typically lasts longer. These shingles are named for their visual appearance, which looks like three separate tabs. These shingles are thin, and therefore less expensive than the others. Also called dimensional, this style uses two bonded layers for added visual appeal. They contain more asphalt than three-tab, giving them more curve. CALL CENTRAL FLORIDA’S ROOFING EXPERTS TODAY! Should I Replacement My Roof or Repair? 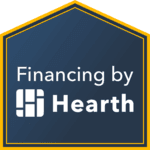 Simple, fast loans for your new roof with payments on average around $150/mo.